Wild animals come into our lives for only brief moments. One must be deft at beholding them. A photographer must also be quiet and at the ready. Fiddling around with cameras and settings can mean lost opportunity. The whirring of autofocus and the thunderous thud of an SLR shutter can scare off humans in the wild, let alone other warm-blooded creatures. I was on a paved path near our home on a warm, spring morning. 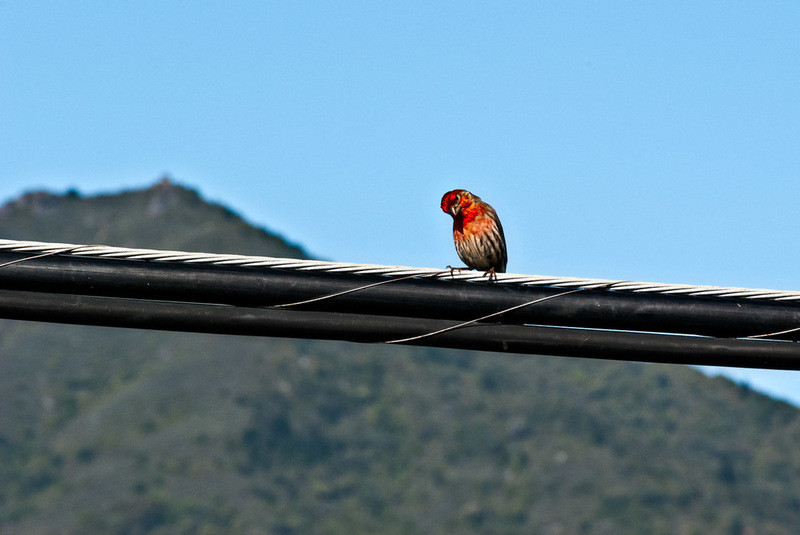 To my delight I heard the sweet song of a house finch. Sounds can be tricky in these parts—they bounce off the complex terrain. Darting my head and eyes about like a fat, house cat I found the bird right above me on a power line. A bold and beautiful little being, the finch continued his song, staring at me intently from his advantageous position. I stared at him, he stared at me. Now silence. I lifted my camera, and squeezed the shutter. It startled him not. He just continued his stare, knowing that I was ever-so-slightly out of his reach. Two more clicks of the shutter rang out. The finch did nothing. On the fourth trip of the shutter he cocked his head and let out a riff that echoed off the hills that surrounded us. Then he flew off in a flash, never to be seen by me again. The encounter left its mark on me and I wondered as to its significance. Every visitation by a wild animal has meaning. I pondered this as I walked past other pedestrians and their dogs. The spell was briefly broken by suburban leaf blowers and lawn trimmers. Then, other songs by other birds brought back the memory of the red house finch. None were so sweet however as that of the red house that brought blessings to a certain spring morning.